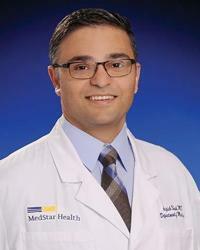 Arpish Shah, MD is an internal medicine specialist and primary care provider. Dr. Shah’s appointment follows completion of a three-year internal medicine residency program at both MedStar Union Memorial Hospital and MedStar Good Samaritan Hospital. Prior to that, Dr. Shah pursued and completed two residency programs with concentration in general surgery, at the Mayo Clinic and Monmouth Medical Center, respectively. He earned his medical degree through the American University of Antigua’s joint program with Kasturba Medical College International Center at Manipal University, in India. Dr. Shah is a strong advocate for health prevention through education. Throughout his career, he has delivered professional presentations and published reports and case studies in alignment with this special interest. He is a member of the American College of Physicians and the American Medical Association.